Are you someone who is growing older and finding their body mobility slower than when you were young? Are you someone waiting while recovering from an injury? Are you someone who works so busily in an office that you wish you had more time to dedicate towards exercising? If your answer to anyone of the above is yes, then allow me to tell you a bit about a wonderfully compact and useful little machine that goes by the name of MagneTrainer-ER Mini Exercise Bike. As the name suggests, the MagneTrainer-ER is a mini exercise bike that can fit under a table and allow you to type on your laptop while you pedal away. Because it is medically-sanctioned, this mini bike is great for people who are recovering from injuries and want to strengthen their muscles again. For this reason it is widely used in medical wards and facilities, and also by chiropractors. Not only that, the ergonomic design and the simplicity with which the bike operates also makes it a great choice for elderly people who need physical exercise in their regimen for health benefits. 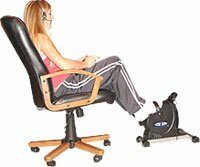 The MagneTrainer-ER mini exercise bike is capable of toning both the upper and lower body while also increasing strength and flexibility. Manufactured out of high quality materials and living up to commercial-grade level of exercise machinery, this bike will help improve your range of motion, and burn away calories along way. 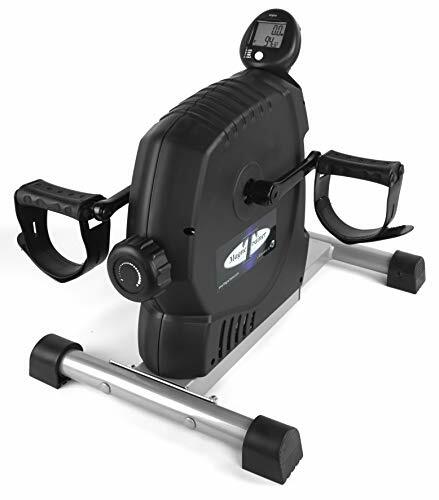 The MagneTrainer-ER mini exercise bike weighs a light 23 pounds and measures at dimensions of 20″ x 18″ x 17.5″. Because it only engages one half of your body, you can easily pedal away while having your hands free for other activities such as using a phone or controlling the TV with a remote. But it you’re working on a desk with a laptop that is where a few things have to be kept in mind. Because the MagneTrainer stands tall at 18 inches, the manufacturer suggests that it is best suited for tables in which the desktop is at least 34” to 36” off the floor thus leaving enough space for the legs to move freely as you pedal. The mini exercise bike is made of commercial-grade steel construction which makes it pretty strong, durable, and robust. Because it is light in weight, the MagneTrainer is quite portable and you can easily take it with you from one place to the next without much hassle. Just because the MagneTrainer is a pedaling bike does not necessarily mean it is meant exclusively for lower body workouts. You can easily place the mini bike on a desk top and use the pedals for arm and shoulder related exercises. Because the MagneTrainer supports both forward and backward motion of hands and feet, you can easily pedal in both clockwise and anticlockwise direction as per your needs in order to increase your muscle balance. A small LCD display on the console displays vital readings such as your total speed, elapsed time, distance covered, and number of calories burned. Whenever you use the bike for pedaling, display turns on and once you are done, it soon turns off. On the body of the bike, you will find a small adjustable knob that sets the resistance levels for your movement. You can incrementally increase the total level of resistance by turning the knob to whatever setting you want and this will increase the resistance and make your workout more challenging. With the help of the knob, you can undertake exercises for physical therapy and amp them up to more cardiovascular workouts. The MagneTrainer will give you three times the range of adjustment compared to other mini bikes in the market. This diversity allows you to more accurately tailor your workout to your fitness level and achieve your goals faster. There are a few traits that make MagneTrainer different from any other cheaper pedal exerciser. One of the reasons is incredibly noiseless and smooth operation. The mini exercise bike is not noisier than a buzzing bee and that is what makes it pretty great to use in office spaces or at your home because it absolutely minimizes the sound that would otherwise be disturbing to others. In addition, it uses more expensive components such as a drive that consists of 4V belts with heavy duty pulleys and flywheels that move the pedals at a smooth pace. It also uses expensive German flywheel bearings. The 15 inch wide is incredibly stable which prevents the bike from shaking or tipping over while you pedal. Although some users admit that over smooth tiles and marble floors, the MagneTrainer is susceptible to little jittering movements. However, that can be fixed by placing it over a rug or against a wall. It doesn’t matter if you’re pedaling with your arms or legs because the MagneTrainer mini bike has wide Velcro straps that are adjustable and into which you can strap your feet so you can move your legs without having your feet slip out from them. Finger grooves are also molded into the pedals that make grappling easier for hand pedaling movements. Sure, the MagneTrainer mini exercise bike may not be the go-to bike when it comes to training intensely and toning upper and lower body muscles. But the bike still more than manages to hold its own when it comes to matters of physical therapy or giving you an adequate workout if you’re too busy working. The parts are high-end, and for the price it comes with the bike shows quality, efficiency, and long-term durability. Best suited for physical therapy and under-the-table exercising.